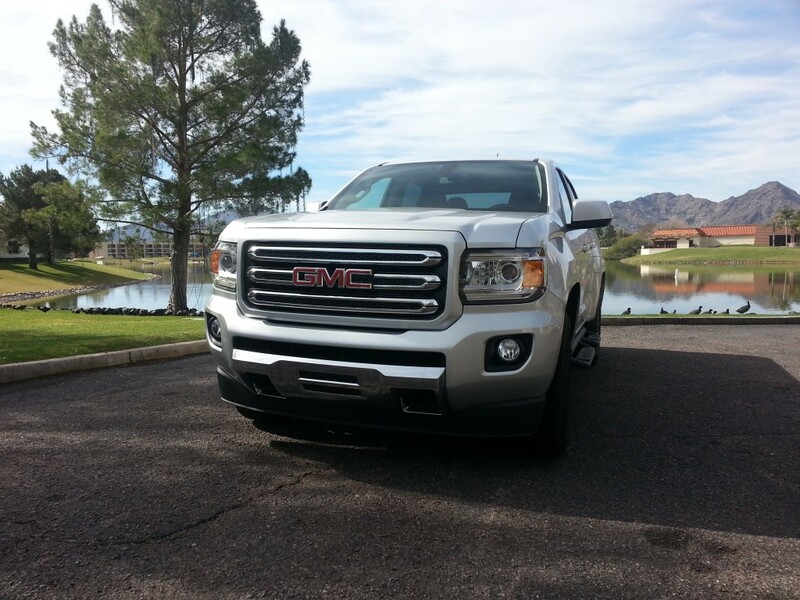 Tons of things have gone on for the members at BAMFAS in our daily lives and careers, this past weekend we worked with GMC on a hands-on weekend with the 2015 GMC Canyon SLE in Phoenix. This article isn’t a total review but a bit of a diary of experiences with the Canyon over the 5 days we had with it. *Full disclosure: Vee / VeGiTAX2 was a representative of GMC at Madden Bowl XXI in Phoenix. We came across our SLE 4WD after arriving by plane, the Quicksilver Metallic finish stood out in a line of new and used cars in the lot. It catches light and stands out with a crisp finish, the metallic flake balances with the paint to catch the eye without being overkill, many silver finishes often fall on the flat side, creating a dull appearance that feels lackluster. While many cars are doing this more, trucks don’t always get the same treatment, GMC put a solid blend in on this color to really catch the eyes. 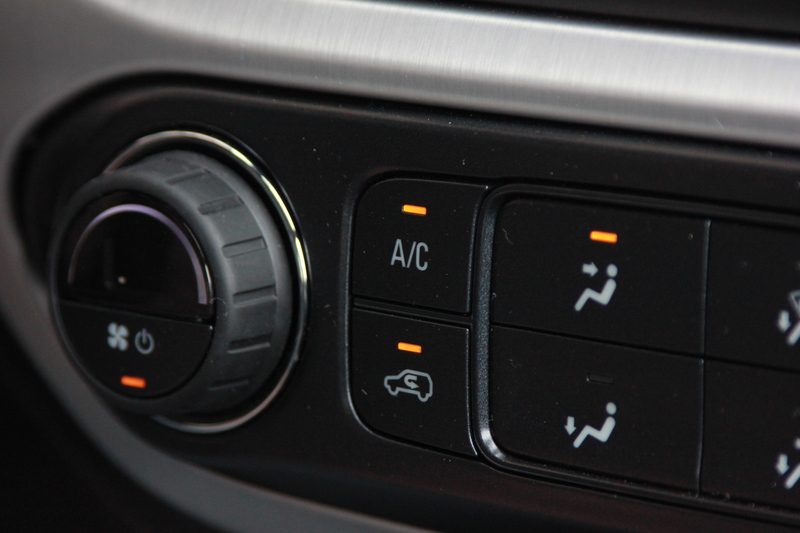 Once loaded up with luggage in the crew cab to prevent any rain from reaching the luggage we were on the move, the dash immediately boots up as the driver enters the car, allowing the nav / user interface to run post with enough time before they pull out of the car. It’s a good consideration to those on the go as the system is ready before the driver is on the move. 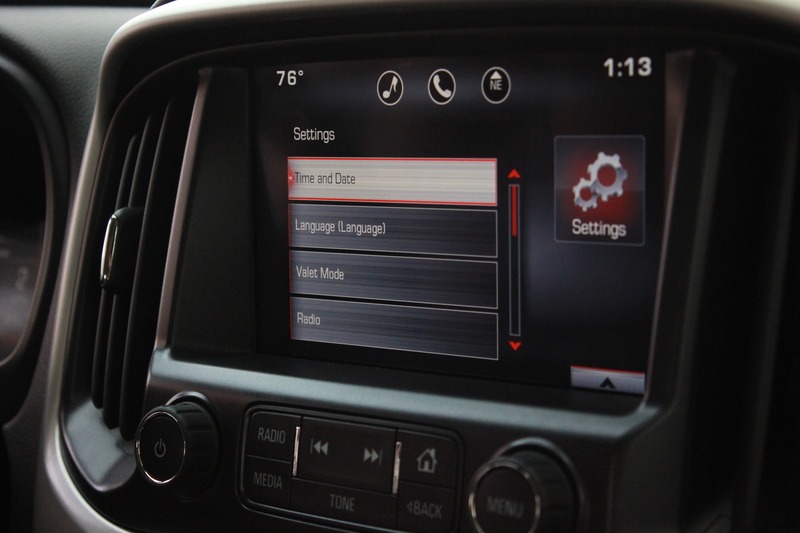 Features like the backup camera engage automatically by response to the transmission choice, the moment reverse engages it kicks on with guidance pattern to help new drivers understand if they’re on the right angle to get out. As a new driver to the Canyon it was a nice help, the radius adjusting on the fly in response to my wheel angles. Once we were on the move it was easy to feel the power of the 3.5L V6, it packs 305hp with 269lb-ft of torque and has no problem picking up the pace as needed, getting on the freeway it rolled on the power quickly to the drivetrain, the key of course is the same with any manual to apply the acceleration equally. 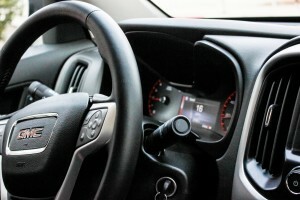 For those who might be heavier on the gas, the manual mode also allows for more control by letting drivers wind out the gears to their desire vs having the automatic try to catch the proper gear to match the acceleration profile. Personally I enjoyed both options, not for power purposes but to feel a closer level of control while cruising as someone coming from manual cars. 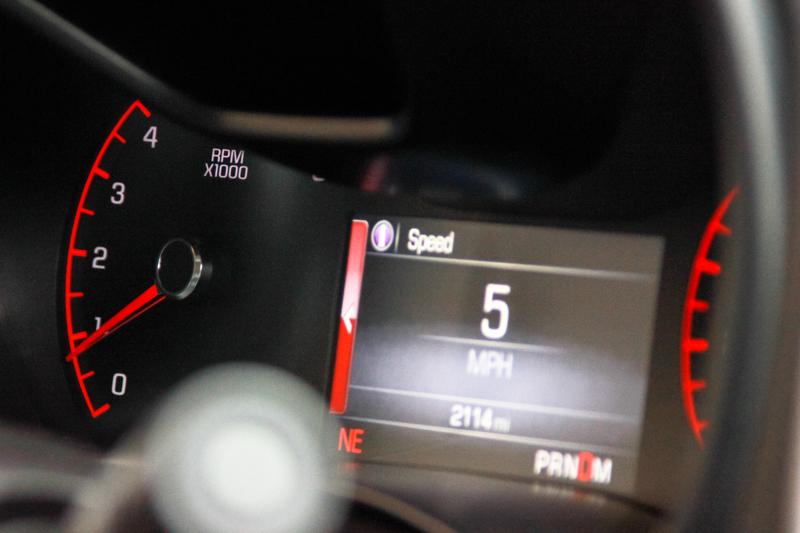 It’s not about winding out gears but just being able to feel things out while enjoying the ride, after a long day though it’s nice to slip into drive mode and leave that up to the automatic to handle. When taking things off on the trail it’s certainly understandable that drivers would want more control of their car also and this completely plays to that area. 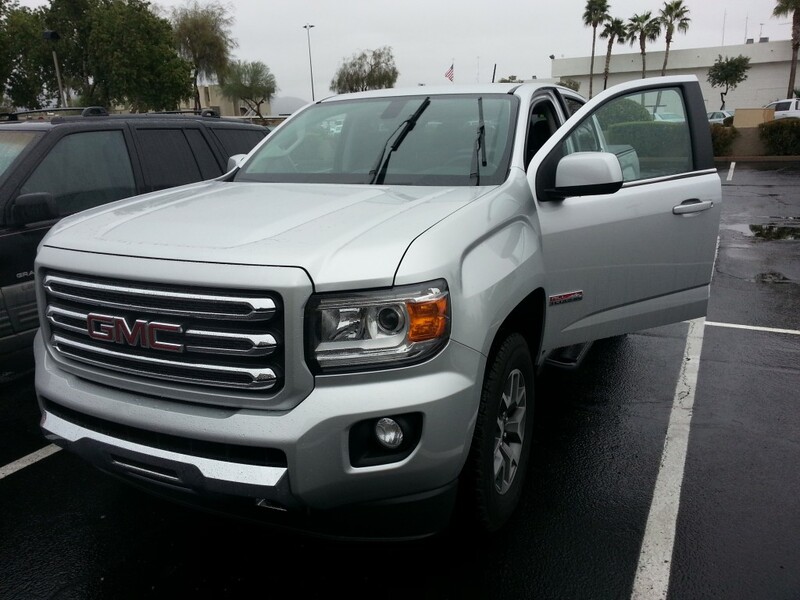 It poured the first few days in Phoenix, while it was fun driving in RWD mode, the interest was putting that All Terrain feature to use, slipping into automatic 4WD mode allowed the Canyon to use best judgement while traveling over wet and puddled surfaces. While running on gravel and pavement we hit many scenarios but regardless the Canyon kept traction on without slip. Regardless of higher speeds on the freeways with sections of flooded underpasses on a fresh first rain or on gravel roads and dirt sucking up water and making puddles the Canyon handled the terrain without issue and in total comfort. With a smooth ride and stable response the key was the steering using the upgrade packages for the all-terrain mode. Luckily the Canyon demonstrated smooth control, fairly generous turn radius and strong grip around the long bends without a lean. Those who get used to the dimensions fast will have no issues in parking lots or tight spaces, the steering response is quick for a higher profile vehicle without having a large dead zone or too much play in the wheel. Even with the electric steering the car still translates the road to the driver without feeling dead or clouded. With smooth control and ride the Canyon of course finishes rounding out the package with a braking kit that allows for smooth speed reduction and quick response in tight moments. While we didn’t push the truck into extreme braking we did have our share of stop and go not just in commuter traffic but in high pedestrian areas and wet weather which tested the response over the days. 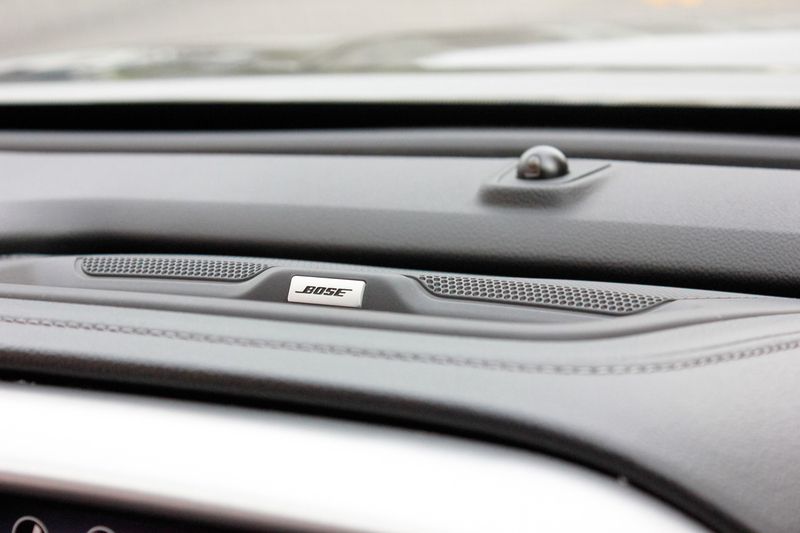 While the Bose audio system within the SLE is very enjoyable, the feature of the GMC Canyon is the cabin sound or really, the lack of sound. 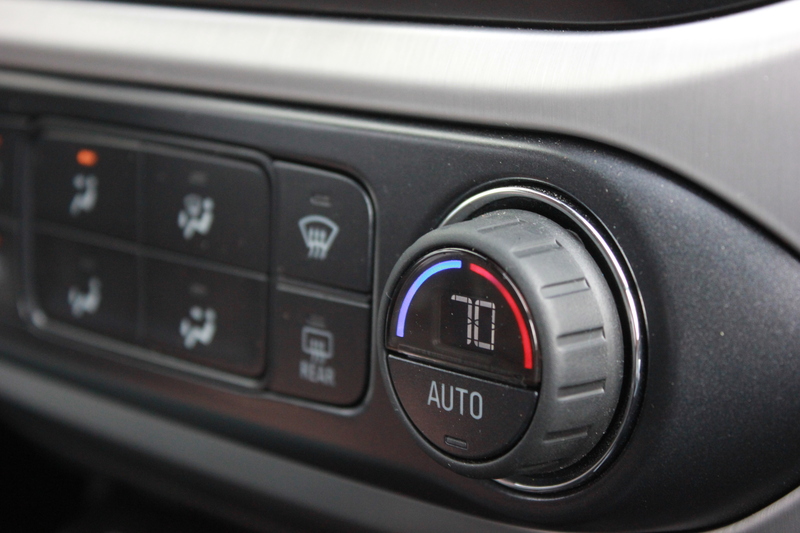 The truck minimizes road noise to allow for a smooth ride experience, instead of hearing every element of the road and nature in the drive there’s a quiet experience that allows for passengers and the driver to talk, enjoy the scenery, use the hands free system or the radio. It’s a genuinely welcome experience for those coming from older models or other brands that have heavier cabin noise that catch winds and rough pavement sounds. 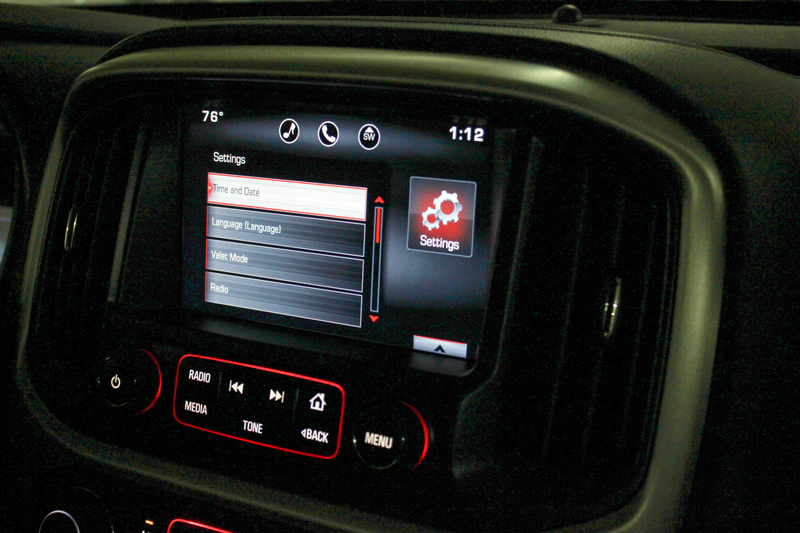 The audio system in the Canyon allows for multiple levels of compatibility, aside from the radio, it allows for XM reception and bluetooth connectivity for media sync. 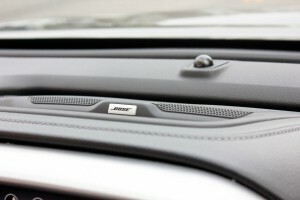 The sound is rich and smooth even at higher volume levels without distortion. The combination brings a rich sound field with nice bass and welcoming midrange, the higher range does suffer somewhat but a bit of tuning with the head unit can fix that. One of the big features of the GMC line is the Professional Grade quality, as such stitched leather throughout the cabin welcomes drivers and passengers in the SLE, it’s a comfortable seating zone for the driver while the passengers can enjoy the stitched leather and metal accents throughout the truck interior and take in the features of USB charging, WiFi hotspot and bluetooth connectivity to share music and heighten the experience while riding along. During the ride it was pure comfort, the electric seats allowed for quick adjustment depending on the time of day and level of traffic with materials that ensured a comfortable ride during the journey. Despite any rougher bumps or terrain, none of managed to really translate to the seating itself. For many it’s easy to claim a top quality interior experience but it’s always clear at some point where the plastic or the vinyl comes into play at just the wrong point. 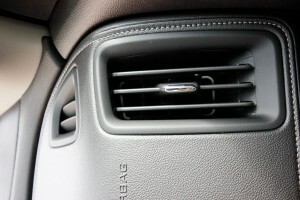 In the case of the Canyon these elements exist when needed (who would really have a leather wrapped 12v port?) and they’re carefully used to keep up the design goals. Our Canyon drive was a positive one, with over 400 miles put on in mixed freeway and street driving we didn’t even go through a whole tank. With a V6 pushing 305hp and variable driving through the experience it was very enjoyable having power and fuel economy on our side. 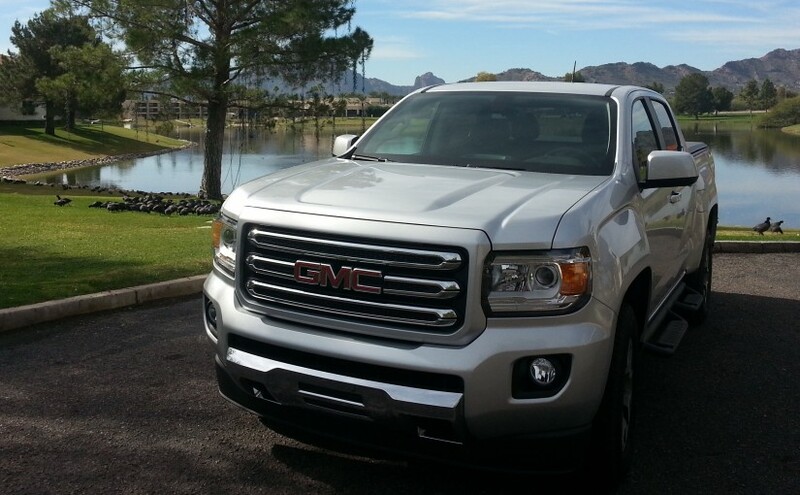 The Canyon provided a smooth ride in multiple driving conditions and a comfortable experience through not only the seating but the low noise cabin and responsive climate control and automated 4WD and even lighting system. After being in other class competitors like the Frontier and Tacoma I can say it’s a very different feel in the Canyon, the ride is stiff enough for off-road but not so much that it’s jarring to the ride, it takes the hits and works hard to make sure everyone has the best ride possible. 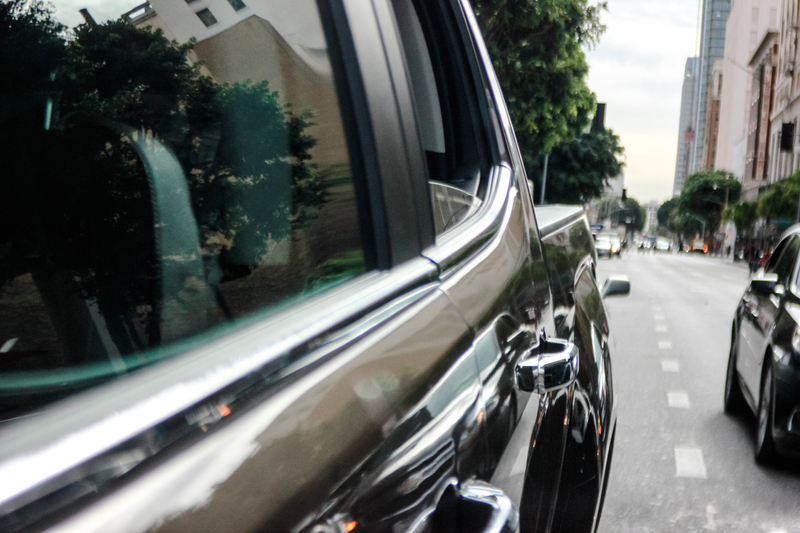 For those looking to find a truck that delivers comfort and functionality the Canyon has the best of both worlds, a comfortable interior for the family and a functional design and power to take on bigger workloads.